This stamp scanner software will scan a page of stamps at once. Save a lot of time when scanning stamp collections. Scan stamp pages then separate & crop automatically faster than ever! Ready for Windows 8.1 and 10! See video and understand this software in 22 seconds. Designed for flatbed scanners, Windows 2000, XP, Vista, 7, 8, 8.1 and 10. Stamp scanning software to help you mass scanning stamps. Also works for coins - scan a handful of coins at once. How to crop an image that has multiple stamps in one? This software can do this task. Scan stamps in bulk. How can I scan several stamps, crop them and save to image files individually? 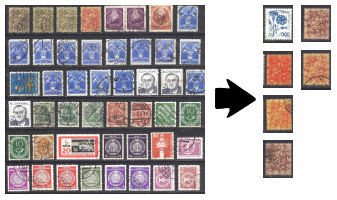 StampScan remarkably simplifies the process of scanning, separating and cropping stamp pages (lots of stamps at once). Just place your stamp page in your scanner, scan them with StampScan and this utility will recognize individual stamps automatically. This process is called batch scanning. Stamps will be automatically detected by the software and split into separate output images. After the automatic detection has been completed you can adjust the clipping and rotation manually if you wish. If you ever wanted to scan coins, this is your software. Put 20-30 coins on your scanner bed and scan them at once. This software will separate the scanned coin collection into individual image files. Alternatively you can take photos of your coins with digital camera and then have this software auto crop the coins. Make sure you have a bit of space (at least half inch) between the coins to make sure they are detected properly. Collecting and organizing stamps is already a time consuming activity. Scanning complete collections is a huge undertaking. StampScan has been developed to speed up this task considerably. Ever tried cropping a page of stamps one-by-one with a standard image editor? It takes a lot of time and effort to do that. I'm sure you have a lot of precious stamps to digitize, but you just could not bring yourself to scan and edit all these images. This is your chance to catch up with that task! Your time is precious, do not waste it cropping stamps in an image editor. Scan your stamp collection with StampScan and save lots of time - this software will greatly simplify the process of cutting out, straightening your stamps from the scanned image. In order to fully enumerate your collection, you need to scan your stamps - which is a really tedious task. This Windows application provides great help in scanning and editing your stamps. Open and save JPG, PNG, TIF and GIF files. Also opens BMP files.